When you think of Breezy Point Resort, the one word that usually comes to mind is golf tradition. – Gregg Wong – Gregg covered golf for the St. Paul Pioneer Press before retiring in 2002. He is a co-host of “Sunday Sports Talk” on KSTP-AM 1500, a member of the Golf Writers Association of America and does public relations work for Grand View Lodge. The resort, founded by legendary publisher Captain Billy Fawcett more than 80 years ago on Big Pelican Lake, is one of Minnesota’s favorite summer resorts. The golf tradition at Breezy Point began a few years after its founding, in 1924, with the opening of nine holes on what now is aptly named the Traditional Course, which these days is an 18-hole favorite. Famed golfers like Patty Berg, Walter Hagen and Les Bolstad played in tournaments on the Traditional Course. The flamboyant Hagen, one of the early stars of the PGA Tour, played a match at Breezy Point in 1928. Berg, one of the founders of the LPGA Tour, won golf a tournament a few years later. And legendary University of Minnesota golf coach Bolstad won the annual Labor Day event, the 10,000 Lakes Tournament, several times. Today, 80 years since the opening of the Traditional Course, eight of the original nine holes still are being used. The original nine holes were constructed with a watering system and bent-grass greens, rare for that era. Bigger hitters can mosey up the road to play Breezy Point’s newer Whitebirch Course, a 6,730-yard, par-72 test with huge greens, multiple tees, trees and natural and man-made water hazards that became an 18-hole course in 1987 after opening with nine holes in 1983. “We put in a new irrigation system and you can really see the results now. The course is starting to blossom,” said Mark Johnson, a PGA professional and Breezy Point¹s director of golf. Off the course, the highlight in the dazzling Whitebirch clubhouse is the Antler’s Restaurant, one of the most-popular dining spots in the Brainerd Lakes area. “Antler’s is always packed from mid-May through September,” GM Gravdahl said. Breezy Point Resort offers almost every type of lodging, from hotel-type rooms to vacation homes with their own private pools. 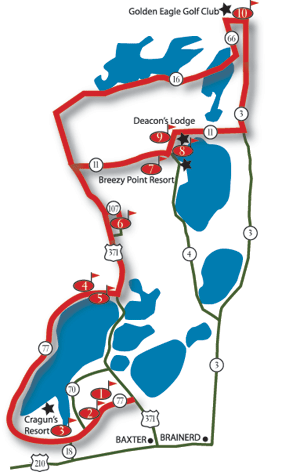 The resort also offers multiple dining choices plus all the typical resort amenities such as fishing, boating and swimming and a unique offering of a year-round ice skating at the Breezy Point Arena. One of summer’s traditional entertainers is Elvis Presley impersonator Chris Olson, who attracts huge crowds for every performance. For information on golf rates and packages at Breezy Point Resort, look elsewhere on www.brainerdgolftrail.com or call toll free at (800) 432-3777. For tee times, call toll free at (800) 950-4960.